In rescheduling posts, this was supposed to get posted yesterday, but something got mixed up. I will be posting today’s track later tonight. Sorry! I have one more track to post from California, not from L.A., but northern California today. This comes from a recommendation from Red Shannon via Twitter. 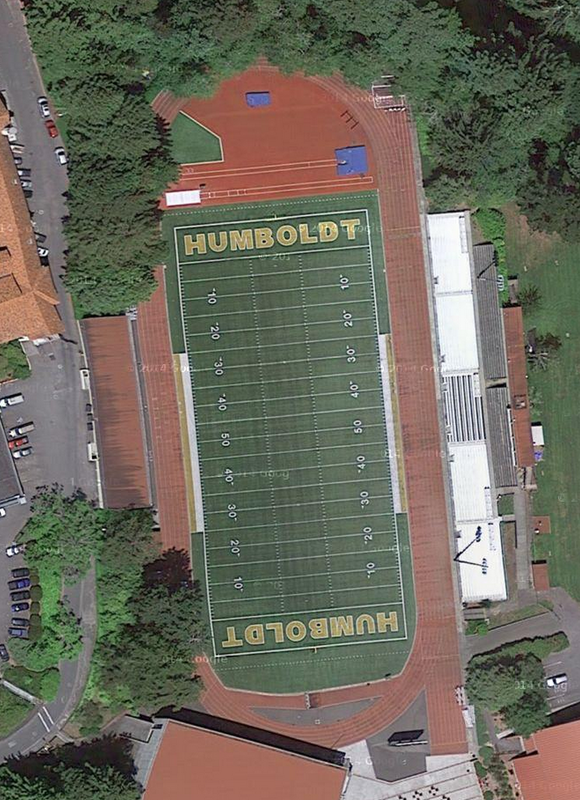 The Redwood Bowl is in a great setting and found on the campus of Humbolt State University. The Jacks‘ home was originally built in 1946 and has a long history. It was renovated just a couple years ago in 2011 when a new artificial turf field was installed, along with a newly installed track surface in the north end D-zone. This track only has six full lanes, but three additional lanes are added to the main straightaway. Surrounded by towering pines, this looks like a beautiful setting for a track! A small photo gallery of the facility can be found HERE.